$225 for the entire workshop. No one-day drop-ins. In the Moving on Center course this Fall, we’re going to sample a tasting menu of three of the major body systems: Organs, Fluids and Nervous System. The organ system distinguishes the body’s “contents” (heart, lungs, liver, intestines, etc.) from its “container” (bones and muscles). Organs have weight, volume, and mass. In concert with the bones they create support, and as “processors” of nourishment, oxygen, waste products, and experience, they store emotion and teach us about desire. Moving with and from the organs gives weight, depth, and meaning to our movement. The body’s fluids are all forms of water—water containing different solids within different bodily vessels. The essential watery oneness of the body’s fluids takes us back to our oceanic origins. Yet they also teach us how to change form and rhythm, since the nature of each fluid—cellular fluid, blood, cerebrospinal fluid, synovial fluid, and lymph, to name a few—is determined by what the membranes of the containing structure allow in or out. The fluid system thus draws us into different rhythms and densities, allowing us to make transitions with ease, flow, and humor. Nerves are the body’s recording system. The lightning-fast electrical transmission of information through our vast, spreading nerve networks allows us to receive and to respond to myriad stimuli, both inner and outer, without even having to think about it! Because the nerves “remember,” many of our daily actions are accomplished automatically, freeing the “higher” areas of our brains for imagining, creating, and daydreaming. Shining the light of awareness on the nervous system can give focus and definition, efficiency and precision to our movement. With support, we may also become aware of and begin to release inefficient, outdated, and even painful patterns that keep us from realizing our fullest movement potential. Our tools for the exploration and research of these three major body systems will include “somatization” (BMC’s signature guided movement meditations), improvisational moving, hands-on partner work, vocalization, conversation, journaling, and drawing. As we enter the “mind” of each of these systems, sharing movements, visions, and insights, we’ll be “discovering” them together, re-membering what each of our individual bodies already deeply knows, and bringing that knowing into collective expression. FINNISH HALL, 1970 Chestnut St. Berkeley, CA. USA, 94702-1723. Access info: Unfortunately the Finnish Hall is not wheelchair accessible. There are (a number of) steps to get into the space, and the bathrooms are not wheelchair accessible. $225 for the entire workshop (3 mornings). No one-day drop-ins. *** Body-Mind Centering® is an integrated and embodied approach to movement, the body and consciousness. 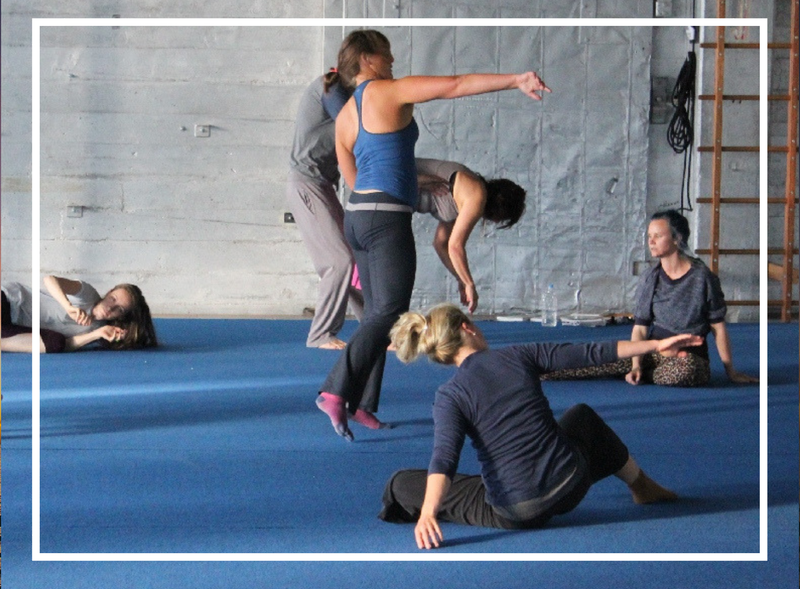 Developed by Bonnie Bainbridge Cohen, it is an experiential study based on the embodiment and application of anatomical, physiological, psychophysical and developmental principles, utilizing movement, touch, voice and mind. Its uniqueness lies in the specificity with which each of the body systems can be personally embodied and integrated, the fundamental groundwork of developmental repatterning, and the utilization of a body-based language to describe movement and body-mind relationships. The study of Body-Mind Centering® is a creative process in which embodiment of the material is explored in the context of self-discovery and openness. Each person is both the student and the subject matter and the underlying goal is to discover the ease that underlies transformation. FINNISH HALL, 1970 Chestnut St.